It was truly like searching for a needle in a haystack: finding an average-dog-size mammal in a vast expanse of boreal forest larger than the state of California. Yet our seven-year effort at the conservation organization WCS Canada to survey the elusive wolverine in the province of Ontario has provided us with a much clearer picture of how this threatened species is faring in its easternmost North American outpost. Wolverines, especially males, have home ranges as large as 1,000 square kilometers. To properly understand their status requires searching over a substantial survey area. We realized that for these animals, a capture, tag and release strategy simply was not going to provide the big picture analysis needed to understand their province-wide distribution and would be enormously expensive to undertake. So we took to the sky. Taking off from a remote northern airstrip, we flew roughly 150 transects between 2003 and 2012 over the vast and unroaded wilds of Ontario’s Far North region. The trips relied exclusively on small two-seater airplanes flown by pilots from Alaska who were also expert trackers. In all, we flew almost 70,000 kilometers over seven winters. Wolverines are most closely related to otters and badgers (and similar in size), but are often imagined as large carnivores given their outsized reputation, fueled by real stories of conflict with trappers (not to mention Marvel Comics tales). From our conversations with First Nations elders and hunters, as well as an examination of trapping and hunting records, we knew that wolverines could still be found in Ontario, but no one was sure how widespread they were or whether there was even a reproducing population. A hundred years ago, it may have been easier to find wolverines. At the time, they inhabited much of Canada and parts of the northern and western U.S. Between the mid-1800s and the 1950s, however, a number of factors led to their decline outside remote areas like Ontario’s northern boreal forest: direct killing, land-use changes, a reduction in their prey, and climate changes that altered snow conditions (wolverines depend on deep snow to hide dens). We designed our survey flights both to cover as much ground as possible and to zero in on areas of interest that we could search more intensively. These included places like the southern edge of the survey area, where forestry is ongoing, and the “Ring of Fire”—a region of heavy interest for mining development with major deposits of chromite and nickel. Our team counted on the exhaustive effort of flying over a map layout of more than 3,000 hexagon-shaped cells to yield enough information to accurately predict whether or not wolverines were likely to be found in adjacent cells or cells where they had not been detected but might be. This involved building a sort of “prediction engine” that combined factors such as habitat conditions, human presence and climate factors to calculate the likelihood that wolverines were present in an area. We detected signs of wolverines—mostly tracks, but in one case an unusually determined animal who guarded a kill even as the aircraft circled above—during only about 14 percent of the flights, which made the ability to predict where else wolverines might be all the more important. Failing to see tracks in hundreds of cells was not for lack of trying—we flew over each of the surveyed cells from one to nine times. 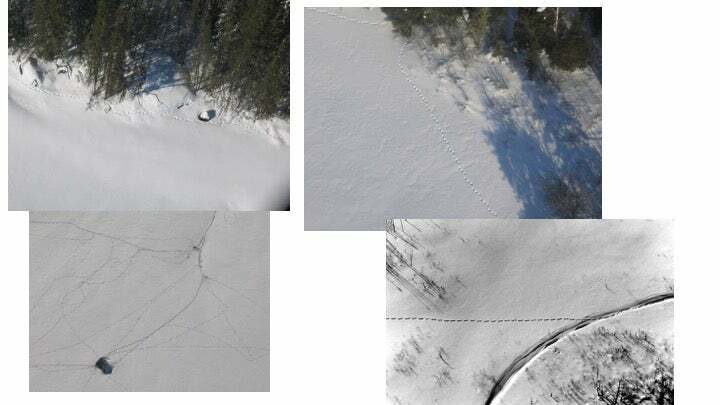 It helped that over the multitude of flights, we were able to develop a “search image” for where we are most likely to find tracks: around lake edges; over and around beaver houses; in a fast, straight line down a lake or clearing. Our two-person crews flew low and slow on days with sunny or bright overcast skies after at least an inch of fresh snow had fallen to ensure the best chance to see tracks. It was a grueling effort, with temperatures often well below zero and hours spent flying over areas without a single human inhabitant or community. But at the same time, what a gift it was to have a bird’s eye view of this remarkable, globally important area. And it yielded results, with a picture emerging of a wolverine stronghold in the northwest quadrant of the province and, equally importantly, better insights into where the animals were not found—and why. Along the southern edge of the survey area, for example, our team found few signs of wolverine despite the fact that suitable habitat, plentiful game and plenty of snow could all still be found here. The two key differences between this area and areas further north seemed to be human activity—particularly roads and logging operations that are not found north of about 51 degrees latitude currently in Ontario—and climate. 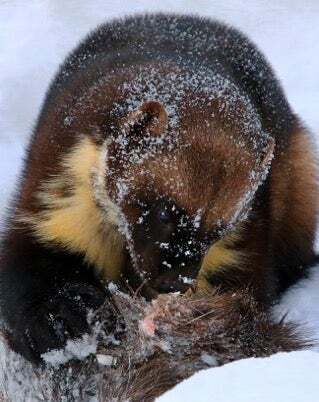 This added to the existing evidence that wolverines do not thrive in areas with high levels of human activity or development and that they may also be vulnerable to a changing climate. 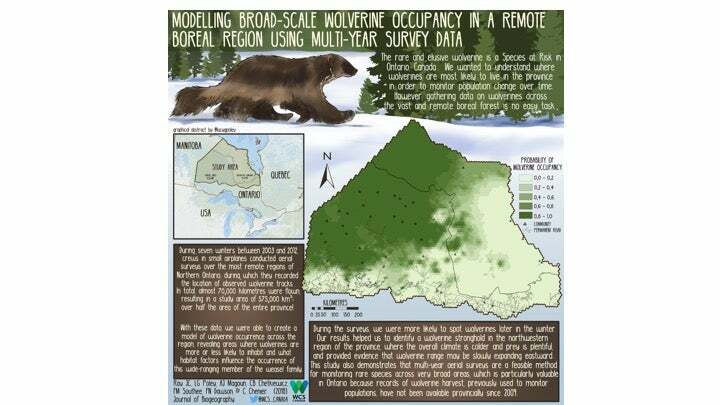 Our survey yielded valuable baseline information on wolverine status in Ontario at a time when the core territory of wolverines in the province increasingly overlaps with areas of keen interest for the extraction of natural resources. That means that in the not-too-distant future, wolverine habitat could be dotted with new mines and criss-crossed by new roads. Knowing what we know now about where wolverines are and aren’t, we can clearly see the need for regional-scale conservation planning before their core habitat is opened to industrial development. For wolverines, there will be nowhere to hide if we simply carry on with business as usual in this critically important area. Justina Ray is president and senior scientist at WCS Canada. She is involved in research and policy activities associated with conservation planning in northern landscapes, with a particular focus on wolverine and caribou.